At the Monterey Bay Aquarium, the bright and colorful oceans are always on display. No exhibit is more vibrant than the jellyfish. 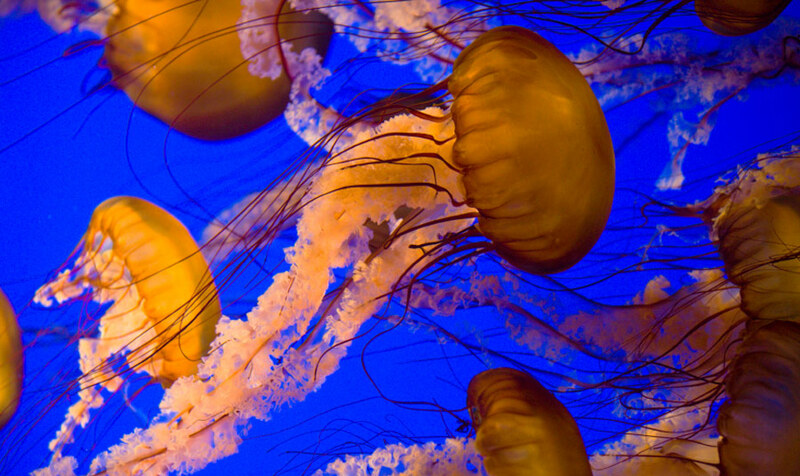 These elegant, swaying marine drifters are some of the ocean’s strangest creatures, and the Aquarium puts them on display in all of their psychedelic glory thanks to the Jellyfish Jamboree from November 2nd to November 3rd from 10:00 a.m. – 6:00 p.m. Although still quite mysterious, learning about jellies is more important than ever. As sea temperatures rise and overfishing increases, jellyfish are finding it easier and easier to reproduce – creating massive jellyfish blooms around the globe. Swelling jellyfish numbers means ruined fisheries, closed beaches, and even damaged power plants. It is vital for those of us living near ocean shores to understand that these enigmatic creatures are both beautiful and often deadly. They are also one of the oldest creatures on the planet; they predate dinosaurs, fish, and even moss! Understanding jellies helps us understand much about early Earth. The Monterey Bay Aquarium is the perfect place to learn about these fascinating creatures, and the Inns of Monterey can help get you there! With our Monterey Bay Aquarium ticket packages, our guests receive overnight accommodations for two, two adult admission tickets for the Aquarium valid for two consecutive days of entry, and a VIP express entrance pass. Stay with the Inns of Monterey, skip the lines, and head straight to the Jellyfish Jamboree!